Handcrafted using the same techniques that were developed by Louis Comfort Tiffany in the early 1900s, this beautiful Tiffany-style piece contains hand-cut pieces of stained glass, each wrapped in fine copper foil. This panel features a classic Victorian design with shades of blue, purple and orange with red jewels. Main Colors: Beautiful tone of Blue, Purple, and Orange art glass. Dimensions: 20 inches in diameter x 0.25 inches deep. Please note: Since these are hand crafted products, the exact color of glass pieces may vary. Colors of the glass will appear darker and less vibrant when not backlit or in direct sunlight. Handmade glass will vary from one piece to the other; glass made at different times will also vary. Stained glass product has been protected with mineral oil as part of the finishing process. Please use a soft dry cloth to remove any excess oil. Absolutely gorgeous!! This is a piece of art. Adds lovely color with the sun coming through. A portion of the price for similar item found elsewhere online. This is a heavy piece of glass. Solidly made. You won't regret buying this one. This is really a beautiful piece of art. The colors are exactly as the photo shows. It seems very well made and is a heavy piece. I would recommend this to anyone who loves stained glass and purple. The product arrived very quickly. The color blue in the image is more blue green, but with glass you have to expect some deviation. I was surprised it was smaller than I thought, I have noticed the description has been updated since I bought it. It is not 26" just under 20 1/2" in dia.. If I had known it was this small I would not have purchased it. Given the size smaller, overall the quality is fine for what I pay for it. It will be beautiful in my bath window. Sizes always seems to be a problem with overstock descriptions. I have other purchases that weren't even close to the sizes in the description. Love it! And a great value! 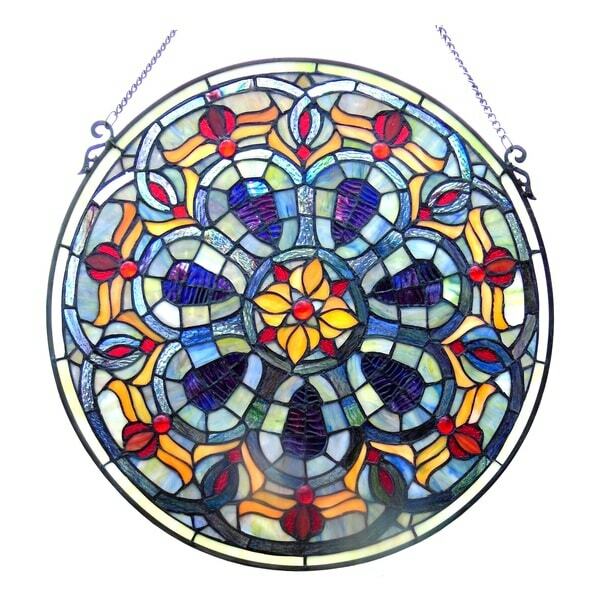 I ordered this to hang in one of the original wavy glassed windows of our 1875 built Victorian. The panel arrived quickly and was well packed. The quality of the structure and materials is what you should expect to get at this price point, so it feels a bit fragile coming out of the package, and upon close inspection, the "lead" is a bit sloppy. But hanging in the window you never notice it. It looks beautiful, the colors are vibrant as the sun comes through, just as pictured. The included chain was too short for my needs, so I ran out to the hardware store and picked up another longer chain. Worked great. I'm very happy with my purchase, and plan to order more stained glass panels from O very soon. Beautiful piece, colors of stained glass are always different in person, changes in the light - Bright lights bring out more subtle pastels, Best is a cloudy light day, this thing glows. Changes from dark purple to light blue. Better in person than online , does not do it justice. I love my window. 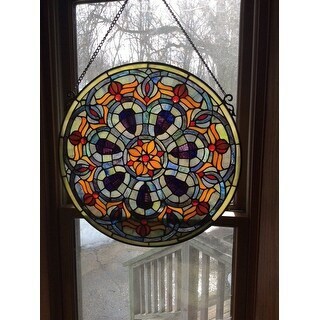 Bought it to put behind a round window in attic above garage. I can see it well when I pull into my driveway even during the day. We set up a led light in attic and the window is beautiful at night. The red gems really sparkle. The window was delivered quickly and in very secure, protective packaging. When this item first popped up in my email from Overstock, I immediately forwarded it my wife as a suggested piece for a new dining spot we were building in the backyard. She quickly fell in love with the picture and arranged the budget to pay for it. When it arrived, I was disappointed it really didn't look like the picture, as the colors used in the actual piece are far more subdued and off hue than those pictured, even in the bright sunlight of morning. After a while, though, it has grown on me and has made a beautiful addition to our project. The quality is good although I did add two additional D-rings at the bottom to hold it with a little more stability. Bottom line: Good craftsmanship, but don't get the picture of the item stuck in your head. I purchased this window panel for a upstairs attic window. I placed a small light behind it for night-time viewing. The colors are beautiful and the glass is well made. The design is just what we needed for some additional detail on our home. I like the combination of primary colors red, yellow and blue used in this. It is quite large and is beautiful. It's especially nice when the sun shines through the glass. It's quite heavy and needs to be handled carefully so it doesn't pull apart. It was packaged very securely and arrived in good condition. I bought this to cover a window in my stairwell to the third floor attic, so the neighbors wouldn't see the green carpet through the window. The window is shaped like a stop sign with mullions. This panel fits perfectly, was inexpensive, and makes a great night light when I leave the stairwell light on at night. This stained glass was even lovelier than I expected, the colors were so vibrant and eye catching - it was true to size -and came so swiftly after i placed my order-completely satisfied! This product did not match the colors shown online. It is much prettier online and much darker in real life. Disappointing that the colors online did not accurately show the colors of the stained glass. I ordered 3 pieces. They are beautiful but this one had a tiny flaw. My husband threw away the packaging so have to keep it. I think I can fix it. Overall these pieces are very nice. Beautiful in my window. Quality workmanship. Worth every penny. great price, great looking piece, I am sure we enjoy for the rest of our lives! I bought this to go in our large kitchen window and it looks beautiful. I love the Victorian look and went perfect with my kitchen decor. Its absolutely stunning when the sun hits it. Thinking about purchasing another for my other window. Thanks overstock. This hangs in my kitchen window and is as beautiful as it appears in the photo. It is extremely well made, heavy duty and is packaged very well for shipment. Mine arrived in excellent condition and was super easy to hang. It has a very substantial chain for hanging so no worries there. I love blue and reds and it fits inside my accent windows, haven't seen it yet, but I hope I love it! "Hello, how thick is this item? Thanks, Vadim"
Hello abovady, the glass is estimated 0.12 of an inch so the overall is a quarter of a inch. Have a great day! "does it come with a chain for hanging? or suction cups?" Yes, this item has a chain for hanging.